Wayland is a Saxon character closely related to the Norse myth of Volundr. In both Norse and English tradition Weland is ‘of the race of elves.’ There is much more about Weland in Jennifer Westwood’s ‘Albion’ (pages 278-282). He is mentioned in the epic ‘Beowulf’, in Geoffrey of Monmouth’s ‘The Life of Merlin’, in Sir Walter Scott’s ‘Kenilworth’ and in Kipling’s ‘Puck of Pook’s Hill’ (see illustration pg 51 in ‘Mythology of the British Isles’ by Geoffrey Ashe (Methuen 1990). Contemporary references include Radiohead’s ‘Pop is Dead’ video (filmed there) and Julian Cope’s song ‘Wayland Smithy Has Wings’ on ‘The Skellington Chronicles’. 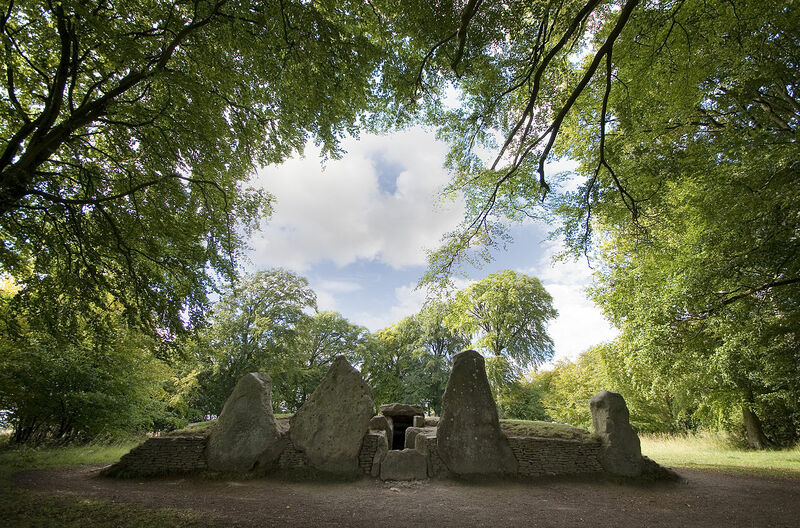 There is just something about Wayland’s Smithy, built in two phases from 3,590-3,550BC and from 3,460- 3,400BC, that captures the imagination. ‘Awe inspiring’ it is. Location: B4507 from Compton Beauchamp towards Kingston Lisle. Turn left for Woolstone, turn right uphill, cross the Ridgeway, turn right again. The Smithy is in a copse 600 yards along the track.